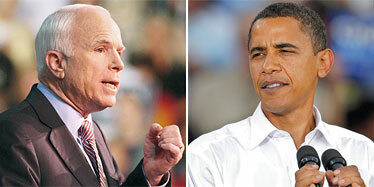 Democrat Barack Obama, right, campaigned yesterday in Las Vegas; Republican John McCain rallied Tuesday in Tampa, Fla. 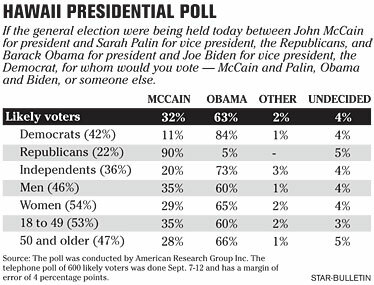 Native son U.S. Sen. Barack Obama leads his GOP rival, U.S. Sen. John McCain, 63 percent to 32 percent in a new Hawaii poll. The survey by the American Research Group, based in Manchester, N.H., shows Obama leading in Hawaii across several demographics, including men (60-35 percent), women (65-29 percent), voters under 50 (60-35 percent), voters 50 and over (66-28 percent), and independents (73-20 percent). The poll of 600 likely voters, conducted Sept. 7-12, has a margin of error of 4 percentage points. In recent ARG surveys of 25 states and the District of Columbia, only the latter topped Hawaii's level of support for Obama - at 82-13 percent. A new national survey shows that Hawaii is one of the strongest support centers for Sen. Barack Obama's Democratic presidential campaign. The survey conducted Sept. 7-12 of 600 likely voters in Hawaii shows 63 percent will vote for Obama as compared to 32 percent backing Republican Sen. John McCain of Arizona. The poll shows slightly more support for Obama among women and those 50 and older. It also shows Obama swamping the independent vote, with 73 percent of those who say they are independent reporting that they will vote for the Hawaii-born Punahou School graduate. The District of Columbia is the only surveyed area with a higher rating for Obama, where 82 percent say they will vote for him. The survey shows that Delaware (home to vice presidential nominee Sen. Joe Biden), Illinois (the state Obama represents), Maine, New Mexico, New York and Rhode Island are the only other states to give Obama more than 50 percent of the vote. California, Connecticut and Massachusetts, where Obama also holds significant leads, were not among the 25 states polled most recently by ARG. Andy Winer, Obama's Hawaii coordinator, said the campaign welcomes the high numbers. "These results indicate that the people of Hawaii recognize the type of positive change that its native son, Barack Obama, will bring," Winer said. "Over the next several weeks, we will continue our aggressive statewide campaign on behalf of Barack, so that we can help him deliver the change that this country requires to improve our economy, to develop energy independence and to begin the process of ending the war in Iraq." Local GOP members of the McCain campaign did not respond to calls for comment. Hawaii has proven to be a solid friend of Democratic presidential candidates. In its 49-year political history, Hawaii voted for Republicans just twice. In 1972, incumbent Richard Nixon won Hawaii with 62 percent of the vote and President Ronald Reagan picked up 55 percent of the vote in 1984.